This almost unknown, large scale (almost 3 hour) oratorio, The Triumph of Time and Truth, was composed by Handel in Rome in 1707 and revised by him for performances in London’s Covent Garden in 1737 (the version recorded here) and then translated into English, revised again and presented, with new additions, in 1757. 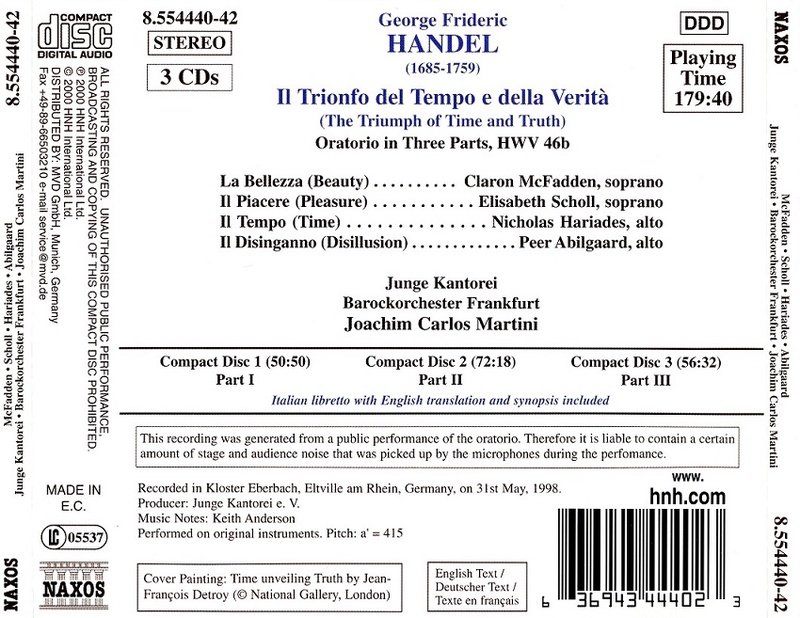 The performance recorded here contains, probably, everything Handel composed for this work in its various incarnations, and then some: A brief organ concerto by the composer is added to the second part’s introduction and another pops up before the final chorus; a number from the serenata Acis & Galatea is inserted at one point; and a Saraband for two harpsichords from Handel’s Almira is used as an interlude in Part III. Furthermore, some will recognize the beautiful aria from the original, “Lascia la spina,” which became “Lascia ch’io piango” in Rinaldo, set to another text and very different music. All that aside, this windy work, in which four characters (here, two sopranos and two male altos) stand for Beauty, Pleasure, Time and Disillusion and duke it out until each characteristic opts to serve a better, higher cause, is definitely worth hearing. 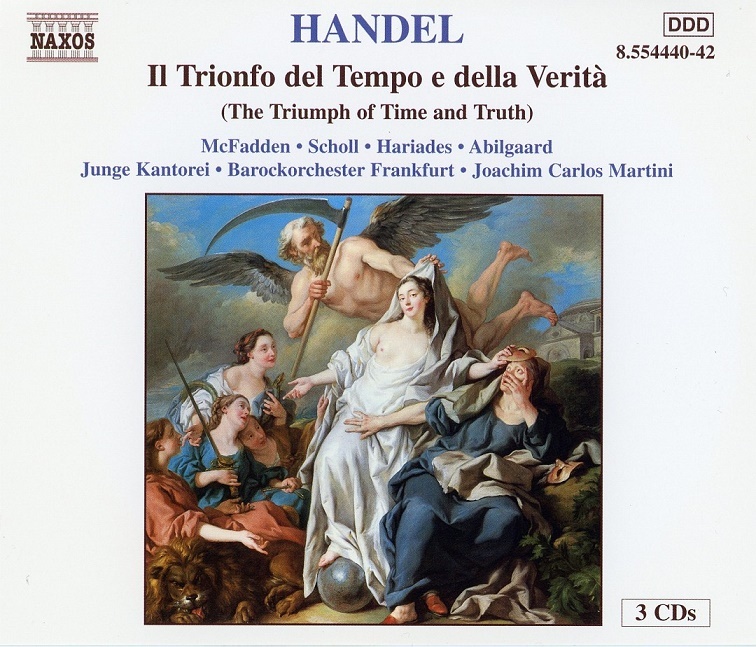 It contains the appealing, straighforwardly Baroque (if there is such a thing) style of Handel’s early Italian cantatas, mixed with his later sophisticated choral writing and dramatic recitatives. The singers have plenty to do. Both sopranos–Beauty and Pleasure, who sound uncomfortably alike and therefore cut somewhat into the drama–are excellent, with particular kudos going to Claron McFaddon’s Beauty for her lovely trills (especially in #29, with continuo), and both male altos are agile, involved, and just a bit weak in their lower registers. The chorus, which is very big and appears to have been recorded from a far greater distance than the soloists, is splendid, as is the orchestra under Joachim Carlos Martini’s leadership. The resonant acoustic makes the soloists sound a bit lonely, but otherwise, no complaints. 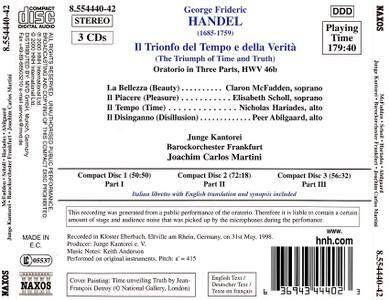 This remains the only recording of the 1737 omnibus version of the work, and Handel lovers should flock to it.